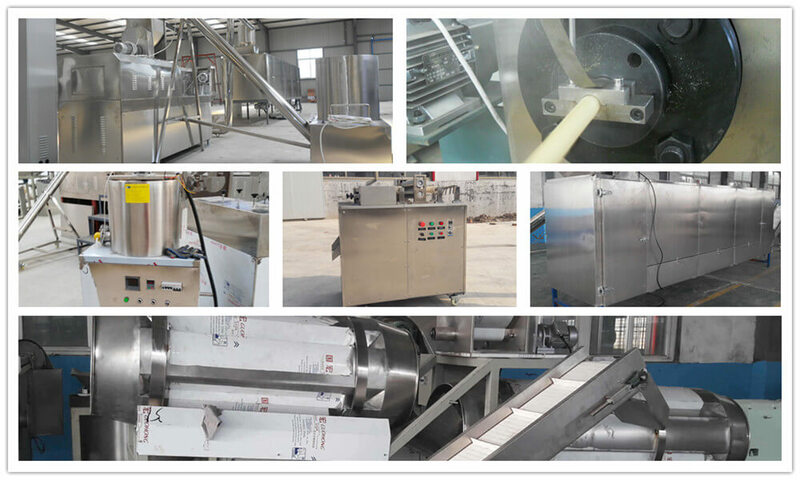 This core filled snack production line can once finish all processes with high degree of automation, from raw material preparing, extruding, core filling, shaping, cutting, spraying, flavoring to getting finished products. Besides the core filling snacks, this puff line can also produce rice crust, crackers, breakfast cereal, corn flakes, etc. After puffing, the snack food has the quality of crispy and unique taste, easy digestion, convenient to carry, which is the ideal leisure food. * Reasonable design, strong stability, flexible configuration, simple operation and high degree of automation. * Accurate parameter control and perfect process flow ensure the stability of final product quality. * Wide application range of raw materials, like corn, rice, wheat, potato, rye and many other products. * Different models and configurations for making different products. * Main engine adopts advanced frequency speed regulating technology, ensuring strong power and stable operation. 1. Flour mixer: Mix the raw materials like corn flour, wheat flour and rice flour, etc. with a certain amount of water evenly and sufficiently. 2. Material loading machine: It is the screw type conveyor with an electric motor. Feed the mixed materials to the feeding hopper of the extruding machine to ensure the convenient and efficient loading. 3. 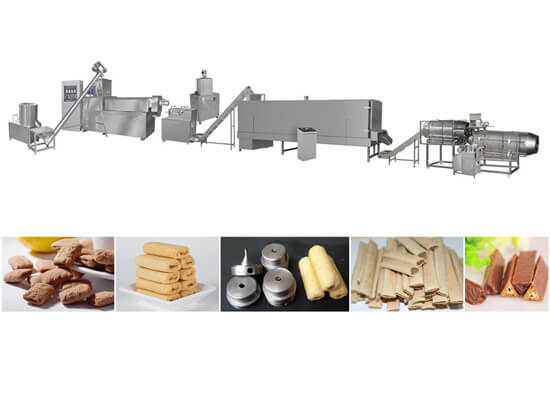 Twin screw food extruder: Choose the proper extruder according to the capacity. Raw materials fall into the extruding system from the feeding hopper. Under the function of high temperature and high pressure, the products are squeezed out. We can set different configurations for making different products. 4. Core filler: By the puff filling machine, the core materials are injected into the hollow tubular snack immediately after produced from the extruder. The core materials can be peanut butter, chocolate cream, maltose, etc. 5. Cut-off machine: It is used for cutting off the snack with core materials. The length can be adjusted from 2cm to 20cm. 6. Elevator: It delivers the snack to the oven. 7. Multi-layer Oven: The oven is mainly the electric type. Temperature is adjusted automatically from 0℃ to 200℃ through the control cabinet. There is a double-layer stainless mesh bag inside. The baking time is adjusted according to the speed. After baking, the main ingredients and core materials permeate each other, thus enhancing the flavor, reducing the moisture and prolonging the shelf time. 8. Auto Flavoring Line: There are the octagonal drum, single drum, and double drum flavoring. According to the capacity and product characteristics, we also have oil spraying, sugar spraying and coating equipment for your choice.